There are many irreversible phases of being in the anime fandom, one of which is when you find that the local anime stores can no longer satisfy you, be it due to lack of variety, inability to get intended rarer products or other varied reasons. That’s when you take the next step: purchasing the merchandise online! Yep, I’ve just taken that new step by ordering the Saber in Tuxedo Costume and pre-ordering the June release Saber Lily Avalon. And as of writing this, the former order has already been delivered to me (actually, it’s arrived for about a week, but I was too lazy to make a post about it till now lol ). Featuring the famous Saber from Fate Stay/Night, this particular figure is based on its prequel, Fate/Zero. 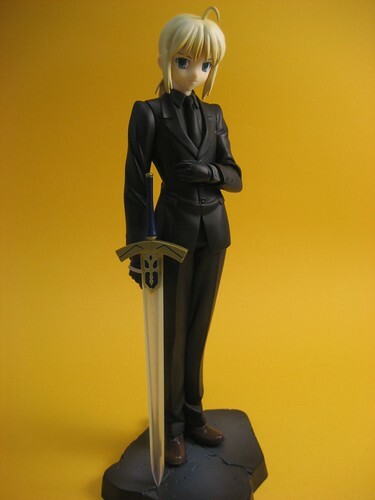 Categories: Figurines & Merchandise | Tags: anime, Black Suit, Excalibur, Fate Stay/Night, Fate/Zero, Figurine, Max Factory, Photography, Saber, Tuxedo | Permalink.